We value our patients’ experience at Family Chiropractic Center. You can read what some of our patients are saying in the reviews below. Also, check out our reviews on Facebook and Google, or leave us one yourself! Our pediatrician recommended that we see Dr. Annie after we had tried just about everything to help our 11 week old son have a bowel movement. He had not had one for 11 days! Dr. Annie was able to see him the same day and did an adjustment. He finally pooped only an hour after his visit. His demeanor changed instantly; he started eating and sleeping better too. Thank goodness for Dr. Annie! Since I started seeing Dr. Annie on a regular basis, my whole pregnancy experience has been much more enjoyable. I feel relief after each adjustment and sleep much more comfortable at night. Dr. Annie shows so much care and takes the time to educate me on maintaining a healthy lifestyle and pregnancy. I came to Dr. Annie with extreme low back pain – I couldn’t even stand up straight! In just a few visits I felt phenomenal – and left the first visit standing upright again. The staff are friendly and fun to work with. Dr. Annie is caring and knowledgeable. I definitely recommend Family Chiropractic. I am 62 years old and I went to see Dr. Annie at Family Chiropractic because of lower back problems. I also mentioned that my left shoulder was always hurting and I had no range of motion. I thought I had torn my rotator cuff at some point and would need surgery. She ordered X-Rays of my spine and left shoulder. The X-Rays of my shoulder showed there was no torn rotator cuff, but that I was suffering from something called Hydroxyapatite Crystal Disease! That was my second choice beyond a torn rotator cuff, ha! Dr. Annie recommended laser therapy to reduce the inflammation and pain in my shoulder. I was skeptical because I really didn’t know anything about laser therapy and I wasn’t sure if it would be worth the money. She did a great job explaining how the laser could help my condition. I talked it over with my wife and we decided to try it since I would probably be looking at surgery to remove the deposits around the rotator cuff sooner rather than later. I have to say I am really glad I made the decision to go ahead with the laser therapy. The constant pain is no longer there and I have a lot better range of motion. I can reach across my body with my left arm now without shooting pain in my shoulder. I can also turn my left arm in and out without the restriction I had previously. I was able to complete a project that I was working on at home without any more problems with my back or shoulder. The treatment has done wonders for me and I have to thank Dr. Annie as well as Katie and Macy, who administered the laser treatments. 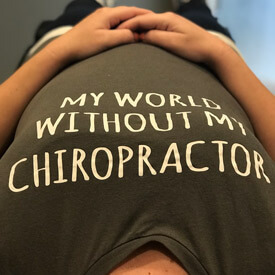 My initial reason for seeking chiropractic care was for general soreness in my back from lifting and carrying my children, as well as lots of bending and lifting in the garden. Once I discovered how chiropractic care worked, I started seeing Dr. Mickelson for illness such as sinus pressure and headaches. It really made me feel good that I could be treated by just adjusting my body instead of putting medications into my system. I have also brought my two boys (ages 5 & 2) to see Dr. Mickelson for regular adjustments. I always wondered why kids might need adjustments, but when I thought about it more, I realized that kids…especially boys are always jumping, falling and playing rough. Their growing bodies need adjustments just as much, or maybe even more than adults. I’ve even brought them to Dr. Mickelson when they were sick with ear infections and fevers. It seems that they usually take a turn for the better after being adjusted. Being adjusted has been great for my whole family, including my husband! It is amazing how well you can feel when you walk out after having something that was clearly out of place. I had never been seen by a chiropractor before Dr. Mickelson and didn’t know much about chiropractic. Dr. Mickelson has really helped my family and I by diagnosing the problem, educating us, and letting us know what she is going to do to fix it. I can’t imagine not being seen by her on a regular basis now. It is a new way for our family to stay healthy without taking medications. Thanks Dr. Annie! I started chiropractic therapy for the first time because of pain in my back, neck, and hips that was becoming very limiting. I had tried physical therapy, massage therapy, and had several ergonomic evaluations at work and nothing was helping. After the first session I immediately felt relief of some pain, and noticed on my drive home that I could turn my head farther than I’ve been able to in years! A few weeks later I felt like a whole new person!!! I have been able to start running again which feels amazing! Dr. Mickelson also taught me ways to adjust my work environment so it is more comfortable for me. I cannot believe how much improvement I’ve seen in such short time! I’d say that I’m back to my old self, but I actually feel better than that!!! I used to be a pretty typical chiropractic patient – I would only come in if I was in pain. I found that I was in a vicious cycle of letting my pain get to a high level before I would do anything about it. Any new activity or change in exercise would seem to set me into a lot of pain. Since seeing Dr. Mickelson, she has taught me how to maintain my body through regular treatments and some lifestyle changes. Now I’m not only living pain-free, but I’ve experienced improvements in my mood, sleep, and digestion. I understand that chiropractic is not only about pain relief – its about improving overall health and day to day life. I started coming in to get treated for Gastroparesis, IBS and sleep issues. After ONE visit I slept 12 hours! Before I was only sleeping up to 2 hours for the past 6 months. I woke up with out being dizzy and nauseous for the first time in 4 years. Everyone is so helpful and nice here, makes you excited to come back. I used to have headaches every day and even missed a lot of school. I used to get car sick all the time too. Ever since I’ve come to Dr. Annie I haven’t gotten a headache or been carsick. I love everybody who works here. I was referred by my husband who is only standing thanks to Dr. Annie. I had only been hurt by past chiropractors. Dr. Annie changed my perspective and greatly improved my quality of life. Plus she is a genuine kind soul and it’s actually fun to come in! I have referred friends and co-workers. Huge fan! Thank you for what you do! After breaking my leg and being in a walking boot for many weeks, I had hip pain and my body felt off balance. When Dr. Annie saw me for the first time, my right leg was over an inch shorter than the left. I have been having adjustments every other week and I feel wonderful. Dr. Annie and her office gals are so down to earth welcoming. I started taking my 4 kids there and they beg to go back. They say Dr. Annie is so cool. One day I noticed my shoulders were crooked, so I took a friends advice and made my very first trip to a chiropractor. I had heard good things about Dr. Annie, so I chose Family Chiropractic. I’ve felt better ever since and will continue to return every other week!